The Brazilian production of stone fruit is not enough to meet its consumer demand, thus requiring importation of fruit from Spain, Chile, the United States and Argentina. Pathogens that cause brown rot, such as Monilinia spp., can entry the country in asymptomatic fruit as latent infections. The goals of this work were to identify and characterize the species of Monilinia from fruits imported by Brazil, to compare their aggressiveness with Brazilian Monilinia isolates under different conditions and to test their insensitivity to fungicides. It was determined that M. fructicola and M. laxa are entering the country through imported stone fruit. Many isolates have the potential to adapt themselves to the conditions of the main fruit producing regions of Brazil. 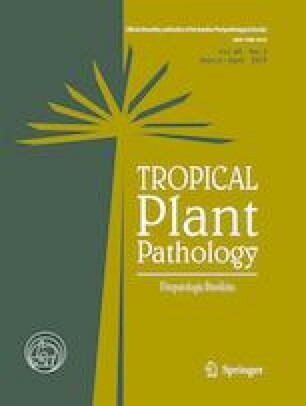 It was observed that these imported Monilinia isolates showed low sensitivity to the fungicides azoxystrobin, tebuconazole, iprodione and thiophanate-methyl, which are the main fungicides used in the control of brown rot in Brazil. All Monilinia isolates tested were pathogenic to peach. M. fructicola isolates from Chile and US were able to cause disease on apples and pears with and without wound. Our results indicated a high risk of Monilinia spp. entering the Brazilian fruit production.